Born in Riga, Latvia, Lia Grippo spent many of her earliest years foraging and fishing the woodlands with her family. Her early relationship with Nature has remained a constant thread in her life. At an early age, Lia was drawn towards working with young children and has been an early childhood educator since 1989. In 1996 Lia founded her first preschool, Seedlings, and in 1998 she opened Wild Roots Forest School, a preschool and kindergarten roofed by the sky and carpeted with the living woodland floor. Lia is a storyteller, naturalist, herbalist, parent educator, mentor and education consultant. Using the arts of storytelling, song, poetry, movement, and play, Lia is dedicated to helping children and families develop their powers of imagination, and through these powers discovering their relationship with all of life. Lia has brought knowledge, compassion, reverence, and magic to her community not only through Wild Roots Forest School, but also through workshops, seminars and mentoring for adults. Having trained and mentored dozens of early childhood educators through her years, she is excited to have co-founded The Academy of Forest Kindergarten Teachers, which offers formal training for forest kindergarten teachers. Lia's commitment to excellence sets a high bar in this fledgling field in North America. Lia is the grateful mother of two tree climbing boys and wife of a exquisite musician. Chelsey Adams is passionate about sharing her love for the natural world with children through modeling thoughtful stewardship, embodied reverence and joyful curiosity. Chelsey grew up playing in the forest of her backyard, watching birds with her naturalist parents, and harvesting much wild and garden-grown food. She graduated from Evergreen State College with a triple-major in Indigenous Studies, Psychology and Wilderness Education. Chelsey spent one year living from the land in Northern Wisconsin in a wilderness immersion program at the Teaching Drum Outdoor School. She graduated from this program with a greater longing for learning the indigenous arts of creating beauty from what Nature provides and began hide-tanning, making fire by friction, cordage-making, and leather crafting. She has shared these skills with children of all ages, teaching workshops in various schools and summer camp settings. She attended the California School of Herbal Studies, deepening her knowledge of the plant world’s many gifts. She has lived and worked as an intern on an organic farm and greatly enjoys growing food for her family. She has been lead staff for The Center for Urban Agriculture at Fairview Gardens’ summer camps and after-school programs. Chelsey is a carrier of many songs, a lover of music, and mothers a joyful songbird of a six year old daughter. Kolmi was born and raised as a young child in the wild beauty and rich culture of Calcutta, with Bengali as her first language. She grew up in northern California, playing in the redwoods, and riding bikes and busses. Kolmi has a degree in Environmental Studies from UC Santa Barbara. From 1998 to 2004, she served as a youth mentor, mentor-trainer, and development staffer for Wilderness Youth Project. In 2005, Kolmi and her husband joined the founding team of Quail Springs Permaculture, a land-based educational center in the high desert of the Cuyama Valley, where she and her family lived and worked "off-the-grid" for ten years cultivating deep nature-connection and community. Kolmi served as Quail Springs' Educational Programs Director, providing earth care, regenerative permaculture courses and experiential workshops for thousands of people of all ages from our local area and around the world. She is engaged in graduate studies in counseling psychology through Pacifica Graduate Institute. Kolmi brings 20 years of experience with nature-based educational organizations to Wild Roots Forest School, and is a co-founder of The Academy of Forest Kindergarten Teachers. She lives in the Santa Barbara mountains with her husband and two children. Sespe Miller was born in Santa Barbara and raised on his father’s small organic farm in the foothills above the city, where he farms to this day. As a young and adventurous boy he explored nearby canyons, and chaparral forests and fell in love with the land, the birds and the animals. His relationship with nature grew more and more intimate as he grew. Sespe apprenticed for two summers and a school year with Earth Walk Vermont, where he studied and practiced ancient teaching methods. Realizing that nature is a tool to strengthen community, Sespe made it his goal to connect people to their natural surroundings and to study a variety of mentoring and teaching styles. Sespe is basket maker, having apprenticed with a master. He is a skilled and knowledgeable naturalist, mentor, and storyteller. Sespe can usually be found making something useful and beautiful with his hands. Sespe is loving life, learning when ever, where ever, and however he can and giving thanks for it all! Jenn has a deep love of and appreciation for nature and all its wonder-filled gifts. She grew up in South Lake Tahoe exploring fresh water lakes and streams, climbing granite boulders and mountains and has always sought refuge in the natural world. She graduated from UC Davis with an emphasis on Spanish language and literature, completed graduate work in Spain through New York University, and obtained her Bilingual Teaching Credential through New College of CA in San Francisco. Her interest in and love of Spanish language and cultures began at an early age and led her to pursue living and studying abroad in Mexico and in Spain. She has been a bilingual educator here in Santa Barbara since 2008 (at Cesar Chavez Charter School, Orca School and Wild Roots), and a mentor for Wilderness Youth Project since 2012 . She is daily mentored by her own spirited boy, who brought her out of the classroom and into the wilds. With her feet on the earth roaming barefoot on the land, singing songs and playing games with the wee ones, she is grateful to experience curiosity alive, and to share in the magic that is everywhere. She loves working with her hands, tending the land, and all opportunities to share and offer gratitude. She is also deeply committed to weaving a vibrant tapestry of sustainable communities. Erin Boehme grew up freely exploring the pastures, creeks and high deserts of the Eastern Sierra, this is where she truly learned about early childhood. Her passion to work with children and families in nature has led her on a journey into teaching. While studying early childhood education and child development, Erin worked as a Public Project Coordinator at Kidspace Museum in Pasadena. In 2000, Erin traveled to Italy to study in the Reggio Emilia Municipal Schools and returned to Santa Barbara to teach preschool and mentor student teachers at Santa Barbara City College Children's Center, volunteer for Wilderness Youth Project and teach kindergarten at Wild Roots Forest School. Erin has been a member of the board of directors for Quail Springs Permaculture, and is a current member of the advisory board. Erin is co-founder and instructor for the Academy of Forest Kindergarten Teachers. and After 19 years in Santa Barbara, Erin has returned to her homeland in the Sierra Mountains where she directs and teaches Wild Roots Eastern Sierra Programs based on her more than 20 years experience in early childhood education. She is an artist and designer that seeks to fuel the creative spirit in herself and others everyday. She is mentored by her 2 children and still runs barefoot exploring in nature. ​C.J. Cintas was introduced to the Central Coast of California while earning a Bachelors degree in Environmental Studies at UC Santa Barbara. His love for the outdoors was sowed early in his life where the waves meet the shore on the Island of Hawaii. C.J.’s journey to the Sierra Nevada was filled with many stops, including Senegal, West Africa where he spent two and a half years working as a volunteer with the Peace Corps and Ojai, California where he tended and taught science based education in a school gardens and at the beautiful Ventura River Watershed. C.J.’s love for sharing and creating new experiences has brought him to the Wild Roots team. ​Anne grew up in southern Germany, playing freely with her sisters: making mud pies on creek banks, running through fields, picking wild berries and searching for trolls and fairies under moss covered roots. Her parents instilled in her a deep love and wonder for the natural world, as well as a sense of belonging. She now lives in the beautiful high desert outside of Bishop, CA with her husband, two daughters and their dog. Anne came to Wild Roots in 2015 as a parent, and has since started on the wonderful journey to becoming a forest school teacher herself. Anne is an avid naturalist, freelance artist, and dog agility trainer. Sister Mulberry has lived in the Children’s Garden at Fairview for many years. She has served as a classroom, a source of delicious berries for humans and animals. Sister Mulberry has had hundreds of children climb on her stable, thick branches, build forts in her lush green leaves, and run around her low hanging branches, listen to stories at the base of her trunk, and daydream in the shade of her canopy. 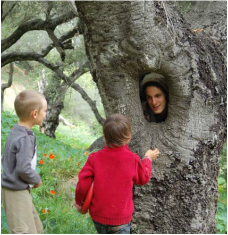 Sister Mulberry teaches with Wild Roots Forest School in the months of November and March. She also teaches during, Summer camps, After school programs, Spring Break, and is always open to visits after hours. Sister Mulberry enjoys her time listening to the birds sing, children’s laughter and playing with Brother Wind.